And I vow that you shall always have a place by my hearth, and meat and mead at my table. And I pledge to ask no service of you that might bring you dishonor. I swear it by the Old Gods and the New. Arise. Mead seems to me quintessentially medieval, and so I had hoped to serve it at my Game of Thrones Season 5 finale party. Unfortunately, the recipes I found called for rather longer aging times than I had expected! (Six months! You should skip to the end of this post for the recipe and start brewing now!) So I marked my calendar for January 2016 to ferment some honey for my Season 6 Game of Thrones finale party. I was looking for a great A Song of Ice and Fire mead quote to start this post – and I found a few – but noticed something interesting in my search. People in Westeros talk a lot about mead, but don’t really drink it often. Outside of this idiom, we hear about the odd cask or two of mead being taken to market or rolled onto a ship, but we chiefly see characters imbibing mead in two scenarios: weddings and wildlings. At weddings, mead wets the lips of attendees at the Red Wedding [See Note 5] and at the breakfast before the Purple wedding, [See Note 6] as well as at Lysa’s wedding to Petyr Baelish. [See Note 7] However, it’s possible that these mentions of mead are also symbolic. In each of these scenarios, the mead (and meat) is shared with a presumed ally who later infamously betrays their mead drinking buddy. I like the idea that mead was perhaps at one point the ubiquitous beverage of choice, and therefore found its way into prominent idioms like “meat and mead” or “sweet as mead." [See Note 12] At some point, it seems wine and ale overtook the popularity of mead south of The Wall (at 1080 mentions and 188 mentions, respectively), however mead’s place in Westeros’ language remains. Like analysis posts like this? 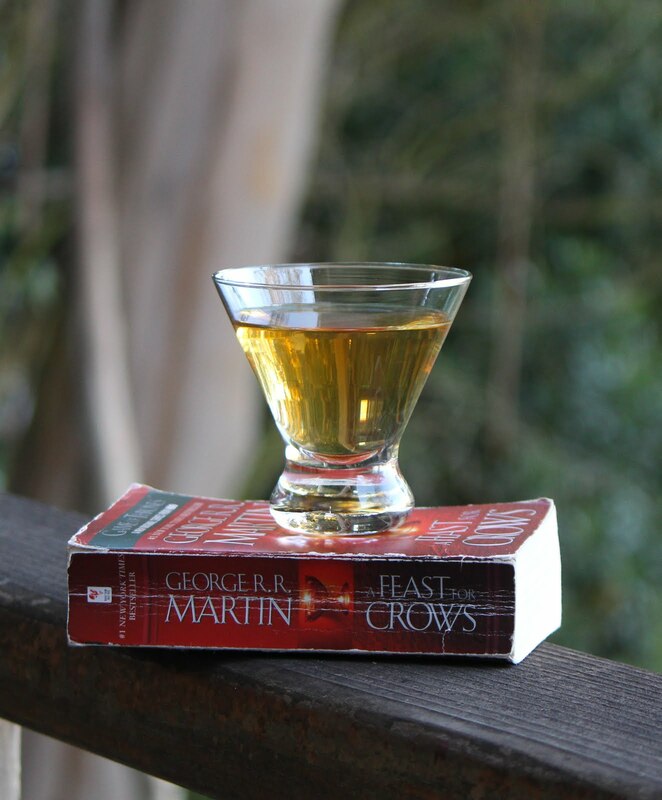 Check out my other analysis posts on A Song of Ice and Fire and other topics, or keep reading below for the mead recipe! Indeed, Dunk remarks on the meaning of this phrase being symbolic more than literal. “At Standfast, ‘meat and mead’ meant chicken and ale, but Ser Eustace ate the same plain fare himself.” – A Sworn Sword. ‘I will send for ale,’ Jon said, distracted.” – Jon XIII, A Dance with Dragons. The mead I made turned out to be much smoother than Tormund’s, with its sweet, floral and lightly spiced taste masking the surprisingly heavy hit of the booze. For my first attempt at this fermented honey beverage, I went with the easiest possible recipe: regular baking yeast, no supplements. This recipe will be sweeter than you might get with champagne yeast or some other brewing yeast (although the alcohol content was certainly strong enough!). Feel free to substitute a fancier yeast, such as white wine yeast or champagne yeast. 2.25 tsp regular ol’ baking yeast. My tap water is pleasant enough, so I used that. Use fancier water if that’s what your judgment tells you. While your yeast and water can be boring, do get a little fancy with your honey and avoid anything sold in a bear-shaped bottle. I used mesquite honey from Trader Joe’s. Since honey is unfortunately not a complete nutrient source (sorry, Pooh), this recipe also calls for the addition of fruit. The recipe’s original instructions called for the fruit to be frozen to sterilize it. Reading I’ve done since suggests this doesn’t really do anything. Don't boil the fruit to sterilize it - the pectins in the fruit will cloud the mixture! The original recipe called for half the cinnamon, no mace and one whole clove, however I personally find clove can sometimes be overpowering. Invite your friends over for homemade Wassail, and keep the 1-gallon cider jug. Honey has antibacterial properties, and the yeast will grow much more quickly than most other things that might find its way into your brew, so sterilization isn’t super pressing. I boiled the airlock, cap and funnel, and rinsed my jug once with bleach and several times with boiling water. Zest your orange, careful to avoid any of the bitter pith. Cube the flesh in small enough chunks to be easily removed from the mouth of your jug. Freeze the raisins and orange (see Note 3). Meanwhile, clean your jug, funnel and airlock well (See Note 6). Cover in foil until use. Using your funnel, pour the honey and half of the water into your jug. Cap the jug and shake vigorously to mix and aerate. Add in the spices, the fruit and the yeast. Fill the jug up until the shoulder. Add a little boiled water to the S-lock, then plug up your jug with the S-lock. Store the jug in a dark and dry corner of your house. You should start to see some very enthusiastic bubbling and a gross glob of fruit and yeast start over the next few days. After one month: The yeast and fruit will have sunk to the bottom and the mead should look quite clear. Decant the mead into a nice and clean bottles. If you’re like me and forgot to hang on to empty bottles, you can boil-sterilize a very large pot to store the mead temporarily while you clean out the original jug. The fermentation should be over at this point. After at least five more months: Get ready to serve! I still had some yeast cake at the bottom of my jug, so I decanted it again into smaller bottles (which I had at this point accumulated). Since I was serving this at my Game of Thrones Finale Feast I wanted a Game of Thrones-y look, so I branded my bottles “House Hues Meadery” – a fictional House and coat-of-arms I created for myself for my Season 5 Game of Thrones finale party. I still had the place setting I used, which looked quite festive on the dessert table. The reverse of the bottle features the Oath a lord swears to his knights, about providing meat & mead. These labels are made from printer paper, red marker and tape. 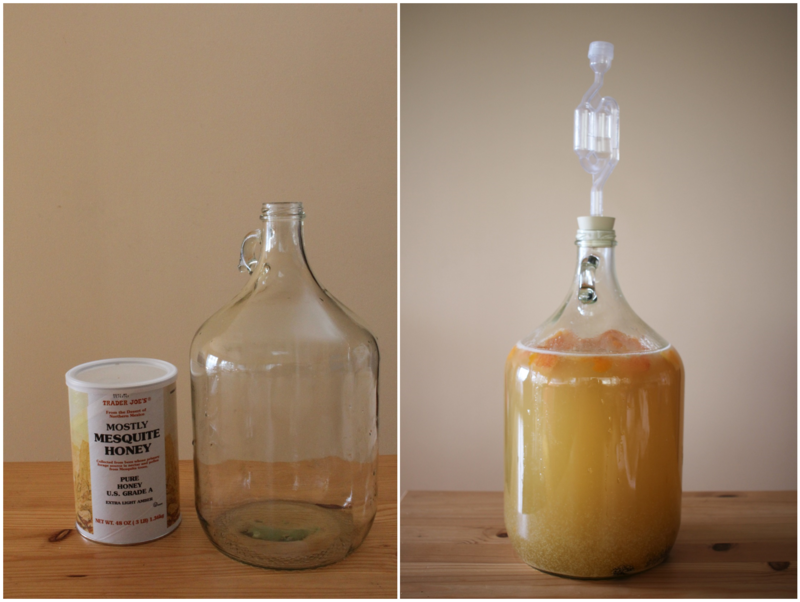 Thanks to Kevin, for passing on his tried-and-true recipes for mead. Thanks to my friends, who are always willing to imbibe wassail to provide me with glass jugs, and are similarly pleased to be guinea pigs for my brewing adventures. Thanks to asearchoficeandfire.com for being such a helpful tool for finding quotes about mead.